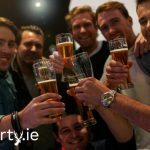 Only an hour and a half from Dublin, Athlone has become one of the biggest stag party hot spots in Ireland! Firstly, our Athlone package includes city centre accommodation with breakfast! Sport Matches: Watch some of your favourite sports on the big screens. Booze Cruise: This is becoming a very popular activity for stag parties! Power Boat: Enjoy this adrenaline fueled power boat for your activity. Paintball: See how good your aim is and spend an afternoon shooting paintballs at your mates. Escape Rooms: You and your mates have to use a variety of mental and physical skills to escape the room so you can all make it to the pub. Inflatable Water Park: Spend and afternoon being a big kid jumping off trampolines, leaping off inflatable cliffs, climbing over obstacles and flying down slides into the water. Brilliant craic lads! White Water Rafting: Raft down the river with your friends! White Water Tubing: Instead of rafting down the river, float down it with a tube!! exciting and definitely one for the water babies. Archery and Stag Challenge: Compete against each other and see who hits the target! Canoeing: Another fun water sport option. Bubble Soccer: the latest craze sweeping across Europe, try this for your Stag Party! Mountain Biking: a brilliant activity to do on the Stag! Whiskey Distillery Tour: Learn how your favourite whiskey is made before enjoying a tasting! Food is arranged in a top bar in Athlone with plenty of big portions. So, you’ll have all the soakage you’ll need. There is a round of shots for your group in another top bar in Athlone! Later on in the night, enjoy a reserved area and free entry into one of Athlone’s hottest nightclubs!